So what do you do with all those strips of fabric that are really too big to throw away but there's not enough to keep for a future project? You make string quilt blocks! 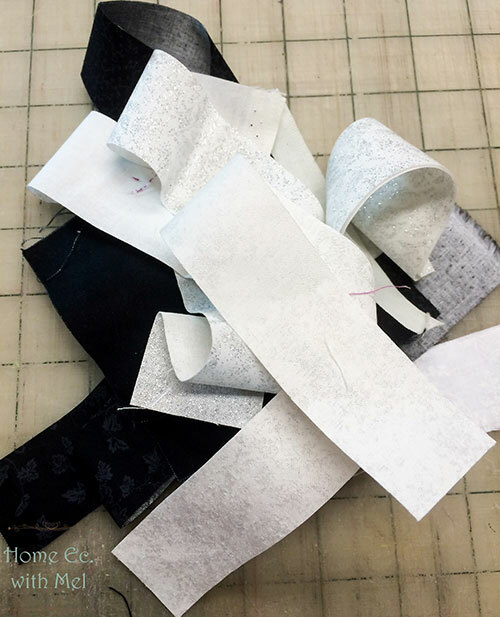 Let's face it quilt fabric is too expensive to toss usable fabric in the trash. 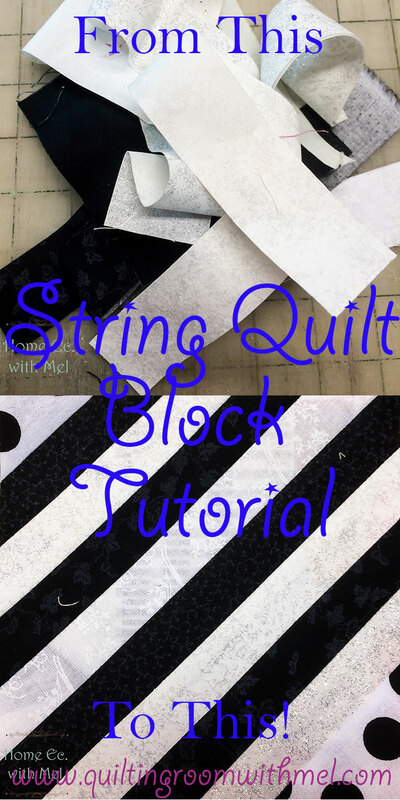 String blocks are simple to make, use up that fabric we just can't toss, and can be used for many things. You can make a whole quilt out of them, you can make a border with them, you can make mug rugs, you could use them in a quilt back, really your options are only limited by your imagination. There really are no rules to making string blocks. That's what I like about them. I can use all one width of fabric like I did for this tutorial or I can just randomly reach into the tub and use whatever piece comes out as long as it's big enough to cover the area. They are mindless and some days that's what we need, a mental break while still feeling productive. Well, I do at least. This tutorial has been one of my most popular posts since it debuted back in 2015. When I was looking over my top posts I was slightly ashamed of the photos and decided that this tutorial needed new photos. That meant remaking a block, well two actually. I like to make them in pairs so I can chain piece. When I set out to do the photos the whole day my anxiety had been running on overdrive. When I sat down at my machine with my two paper squares and pile of strings I could feel the anxiety start to settle down. The mindless process was just what I needed for my mental state and I was actually doing something on my list. So let's make a string block! We need a paper square the size of block we want. I'm working with 5 1/2 inch sqares here. As you can see I use really fancy paper. 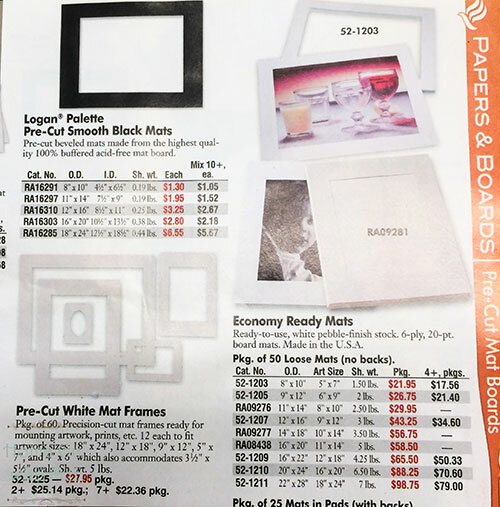 At work, we get catalogs all the time. All of the art catalogs land in my mailbox and I get giddy about them. They are huge and the paper is perfect for string blocks. You can also use phone books, I hoard them too. I remember my mom using newspaper for hers back in the day. The key is the paper is thin so that it will tear off the back but not so thin that it will be cut when your needle goes through it. String quilt blocks are really a green quilting item. String quilts require no new fabric to be produced and we are reusing paper so no more trees are being cut down. Let's talk about fabric for a minute. 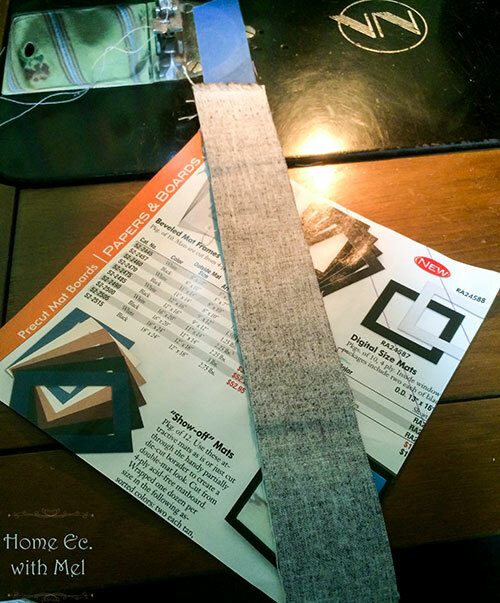 Your strips need to be at least 3/4 inch wide and long enough to cover the paper. As you get to the corner you'll be able to use smaller pieces. How many strips you need really varies. 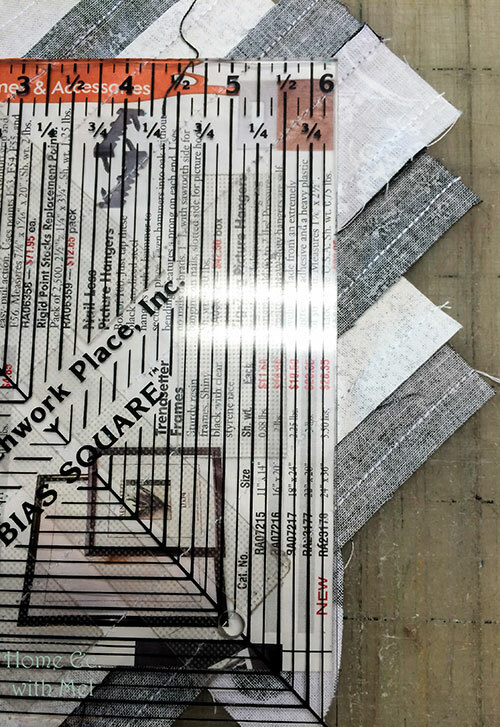 It all depends on how big of a square you are making and how wide your strips are. Let it be organic, even if you use the same width of strips, let the fabric do what it wants to. In the end, your quilt will thank you. 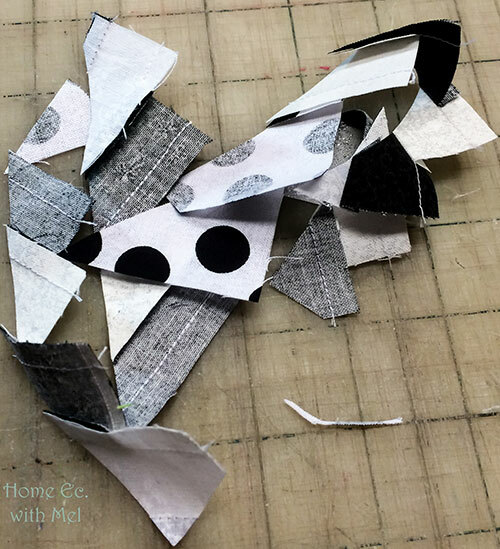 Making a string quilt block is super easy. 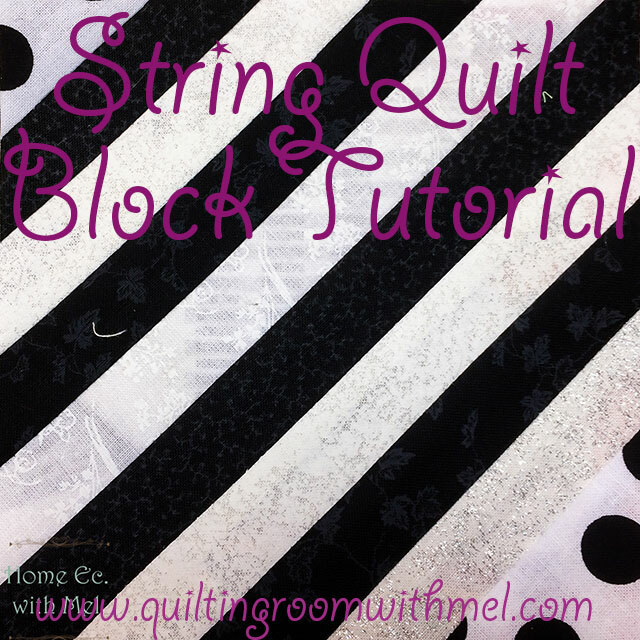 If you learn better by seeing someone put the block together I have a string quilt block video post. Before you start you need to shorten up your stitch length. I shoot for a 1.8 stitch length. On my Necchi BU it's an eyeball guessing game. You want a stitch length that will perforate the paper but not cut it. Also, shut the steam off on your iron. We all know what happens when paper gets wet. 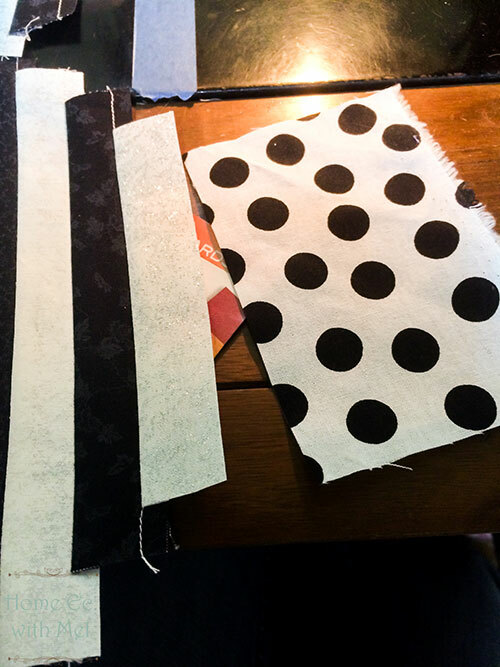 We start by sewing two strips of fabric together to the paper on the diagonal. 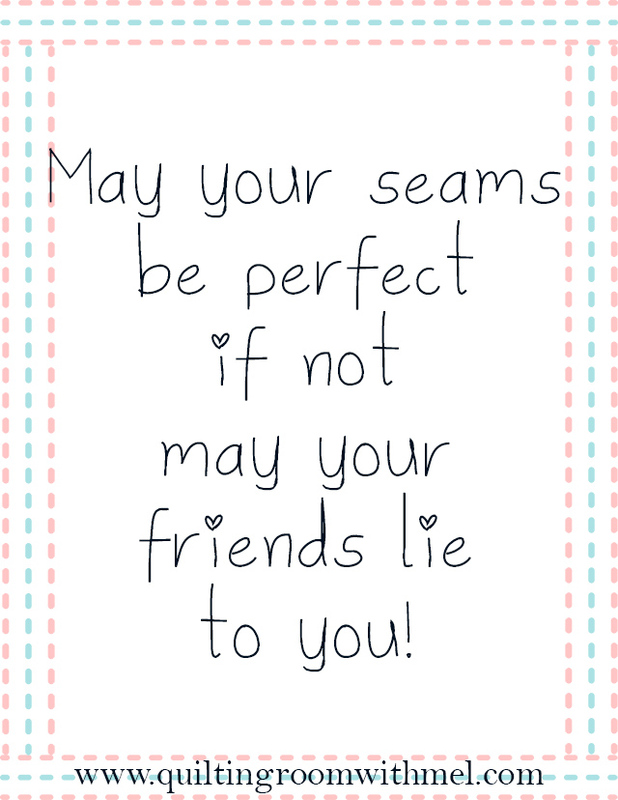 That first seam can be a little tricky. 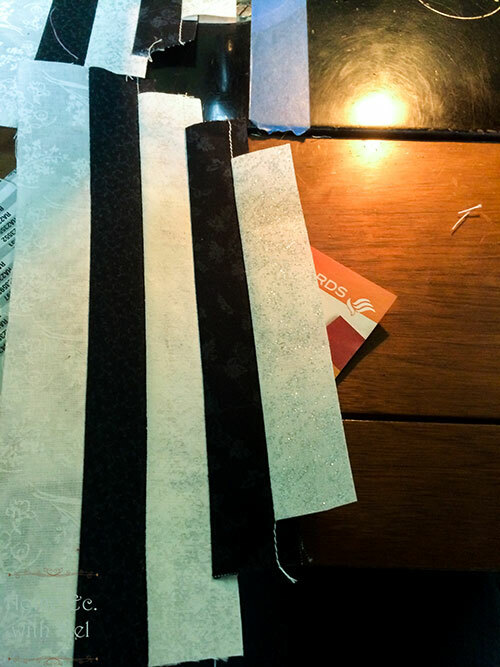 If you don't feel you can keep it all together and straight use a glue stick to tack one of the strips to the paper. Then you only have to keep two things together like normal. 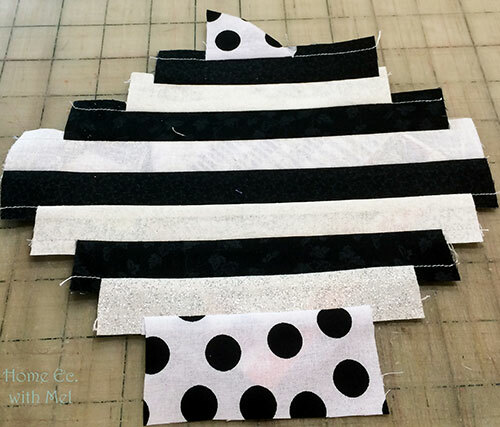 The other thing before you make that first seam is you have to decide if you are going to center that first strip on the diagonal or if you are going to center your seam. I've chosen to center my seam for this project. This is basic sewing and quilting. 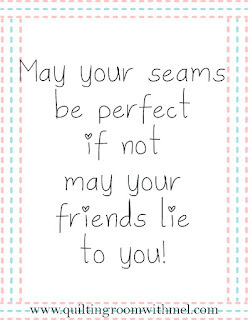 You sew your seam and press it open. Some will just finger press it open, others use a small Clover iron they can keep by their machine, and then there's me who gets up and presses each seam with my big iron. We will call it my quilter's exercise program and pretend it has nothing to do with I can't finger press well or the fact I'm worried the kitty will jump up and hit the Clover iron. Just keep adding strips until you get to the triangle at the end. You really want a piece like this on each end. If it is too small you'll end up with a lot of bulk when you sew the blocks together. That's never a good thing because no one wants a lumpy quilt top. Bulk does not quilt out like other issues. I over size this section. It gives me a little wiggle room when I'm trimming. Now, I don't over size this much, though. I trimmed that piece down a little bit. The paper on the back of our string quilt block is just a foundation and general guide when we trim. If we oversize our fabric just a bit it gives us just a little more room for error. I like room for error, I make errors, often. Then we repeat the same process on the other side of the block. If you chain pieced you just completed two quilt blocks! Once you have both sides done it should look something like this. This certainly won't work in a quilt. We've got to trim it up. This block came out pretty well so I didn't need to cheat the block. I used the paper edge to trim the block. If I needed to though I could have used my square up ruler to trim it like normal. Now you could keep these for a crumb block if you want to or they can go to the trash. Your other option is to set up a trash can just for your trimmings. Those trimmings can be used to make a pet bed. This is what we have now. Isn't she pretty? This block is ready for a future project and my scraps are just little smaller than they were at the start of this tutorial. Oh, there's another added benefit of string quilt blocks, they help to keep your studio cleaned up. Oh, what about the paper on the back? I leave that on until I'm ready to use the blocks in a project. Don't miss out on other great quilting and sewing projects like this one! Sign up for our newsletter and get this printable to make your studio just a little brighter. Don't let your scraps take over your studio make some string blocks today. Don't forget to share your projects with me on social media. I have a picnic basket full of strings I need to use up.